If you're planning your next Florida holiday, a multi-centre holiday to the wonderful destinations of Kissimmee and St. Pete/Clearwater are a must. 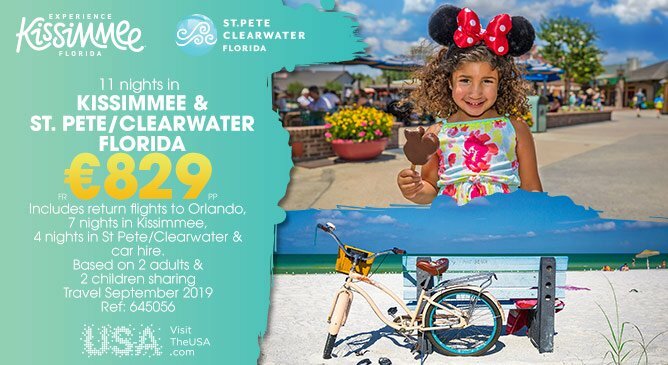 The perfect combination for those looking to enjoy the thrills of Central Florida and the relaxation of the beach, Kissimmee and St. Pete/Clearwater are perfectly suited to families. Kissimmee is a fantastic base for any family hoping to experience all that Central Florida has to offer. Its perfect location offers easy access to Walt Disney World®, Universal Orlando Resort™, SeaWorld® Orlando and so much more. And, in the area itself, you can also enjoy many outdoor activities including hot air balloon rides, thrilling airboat rides, shopping or you can simply enjoy the Florida sunshine by the pool. Endless fun awaits you and your family in St. Pete/Clearwater, Florida. This wonderful destination is the perfect place to enjoy some beach time after a busy few days in Kissimmee. Whether you want to enjoy some time at the beach, shopping or experiencing local attractions, there is so much to see and do. Visit the Clearwater Marine Aquarium and meet Winter the Dolphin, enjoy a culturally enriching experience at the Dali Museum or watch the sun go down at Pier 60, it's all possible in St. Pete/Clearwater. Being only 90 minutes apart by car, Kissimmee and St. Pete/Clearwater are the perfect destinations for your next family holiday. If you’d like more information on these wonderful destinations or the offer above, you can call our travel experts on 01-8173535 or complete the contact form below.